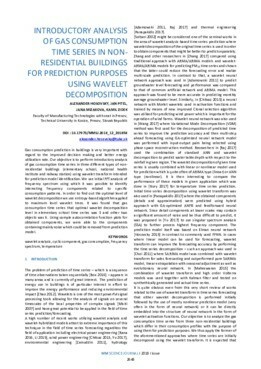 Gas consumption prediction in buildings is very important with regard to the improved decision making and better energy utilization rate. Our objective is to perform introductory analysis of gas consumption time series in three different types of non-residential buildings (elementary school, national health institute and railway station) using wavelet transform intended for prediction model identification. We use initial FFT analysis of frequency spectrum using which it was possible to identify interesting frequency components related to specific consumption patterns. In order to find out the optimal level of wavelet decomposition we use entropy-based algorithm applied to maximum level wavelet trees. It was found that gas consumption time series that optimal wavelet decomposition level in elementary school time series was 3 and other two objects was 6. Using sample autocorrelation function plots for obtained components, we were able to the components containing mainly noise which could be removed from prediction model.